“Stop!” Haylee ordered. “I want some of those flowers.” A farm stand featured large cans overflowing with orange cut flowers. I parked my car. Haylee and I clambered out. . Storybook white clouds sailed in a blue sky, and the breeze was warm with none of the humidity that often drifts in from Lake Erie. “Beautiful day,” I commented to a man in denim overalls and a baseball cap. With a grunt, the man strode toward the farmhouse. A beagle puppy bounced beside him. Each time the puppy’s paws hit the ground, they stirred up puffs of dust. “Your corn looks good,” I managed. Didn’t old timey farmers like to say that corn should be knee-high by the fourth of July? That was a few days away, and the corn in the field beside us was nearly hip-high. “I’ve never seen it grow so fast.” I smiled, probably showing too many teeth in my attempt to appear encouraging and enthusiastic. 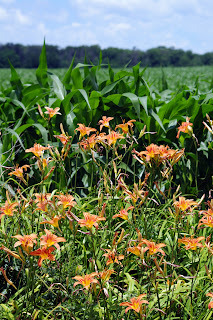 I bought two bunches of daylilies, too. Hoping the woman was exaggerating, we climbed back into the car. I moaned, “Now I wish it would rain.” But those white puffy clouds in that pure blue sky could have been put there by an artist. It wasn’t going to rain any time soon. Have you also been experiencing a dry spring and a mosquito-free June? 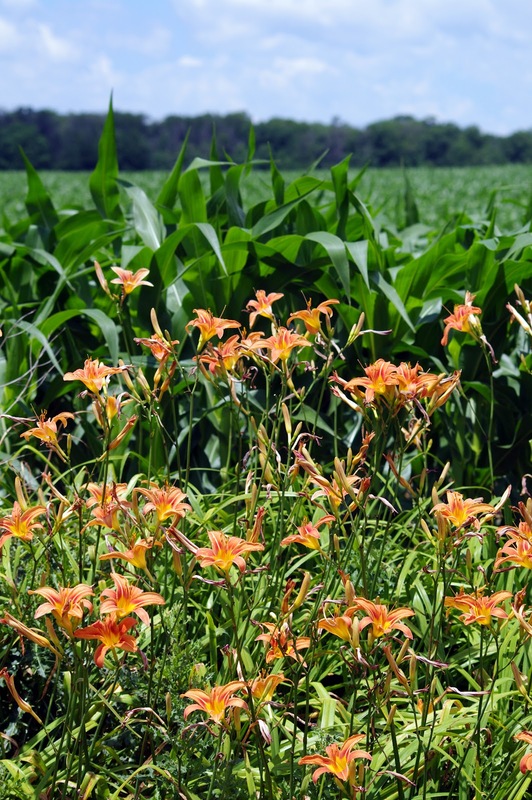 Do you like it, or do you worry about crops and gardens? 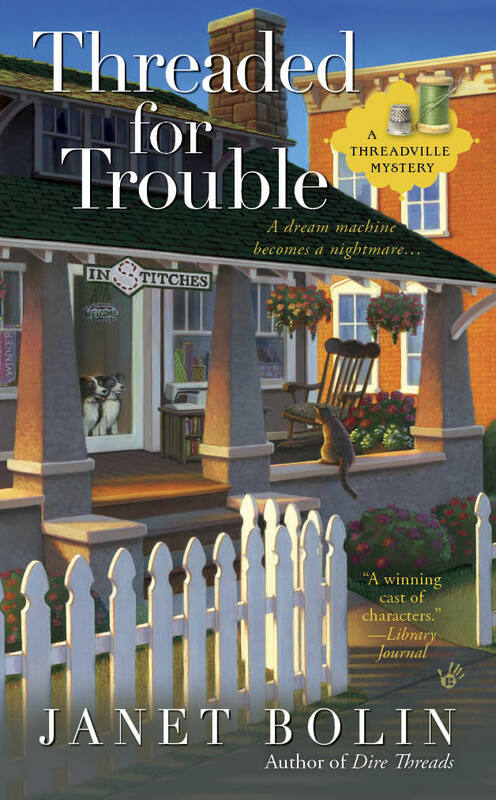 You can find out how Willow and Haylee fare later on, in August, in THREADED FOR TROUBLE, the second book in the Threadville Mystery series. You can order DIRE THREADS and THREADED FOR TROUBLE from any bookstore or from these booksellers. 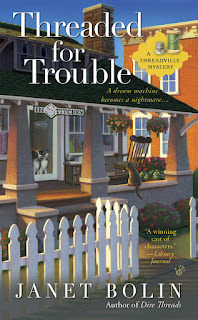 Visit Janet at facebook and twitter and check here again for information about the third Threadville Mystery, due in June, 2013. I don't know about anyone else, but I do love a rainy day! I like it pouring down outside while I enjoy a good book and a strong cup of tea. And my garden could use a good soaking about now!! We seem to be getting a good mix of hot, humid days and rain (often overnight, which is ideal). However, the hot days are winning out in the lawn situation. It's a patchwork yellow and pale green right now. The shady parts of my lawn are still green, but the sunny spots seem to burn in only one day of this hot sun. The soil here on the Lake Erie shore is very sandy, so last night's rain didn't help much, and neither does watering. Willow, we always worry about crops and gardens in Ohio. And sometimes cops and robbers. LOL. Charlotte Bessette, simply being silly today.